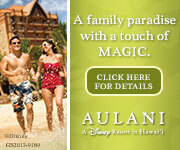 Get Away Today can price out staying at a Disneyland Resort hotel or staying at a hotel in the surrounding area. And this is a great deal on passes! Our family is looking forward to visiting Disneyland is 2017 and all the great Disney fun! If you are planning a trip to one of the Disney parks for Halloween, or you have already booked a visit during Halloween time, there is so much fun stuff to see and do at the parks! We have a quick rundown of what is at either park as well as the dates and pricing for the Halloween Parties. Below are the calendar dates for September and October, as well as color coding for different pricing. On Mondays and Wednesdays, the party hours are 6:00-11:00 PM and Fridays and Saturdays the party hours are 7:00 PM-midnight. Ticketed guests can arrive into Disneyland 3 hours before the start of the party, and we recommend you do that for sure! Disneyland will also offer a special Blue Bayou Halloween Dinner with a 3-course meal. This is an additional expense as well, but it is only available for guests who purchase tickets for the Halloween Party. Not all food locations stay open for the party so it is best to either make dinner plans before you enter or eat inside the park before locations close. They do offer fantastic snacks and treats only for the party and all food is Halloween themed! Additionally, there is a Happy HalloWishes Dessert Package that you can purchase tickets that has a special viewing of the fireworks on Main Street along with a buffet of delicious desserts. The price is $79 for adults and $47 for children. Reservations are required and prices are in addition to special event tickets. Guests can also arrive in costumes but they must follow Disney’s guidelines on costumes. Below are the dates of all the Halloween parties and the different pricing has been color coded. Children must be ages 3-9. If you will be visiting one of the Disney parks for Halloween, there is a lot of additional fun for families. Remember that the Halloween parties run long so always plan something low key the next day so kids can recoup from a long night of fun! It’s almost summertime! Our family is so excited for all the fun activities that come along with summer, and my kids love seeing the great summer movies. We have compiled the list of the family movies coming out in theaters this summer that we think you and your family will love seeing! The Jungle Book – In theaters now! When I was a kid, this was one of my favorite books. And I’m SO excited they are making it into a movie that kids are going to love. AND its directed by Steven Spielberg! If you didn’t read the book by Roald Dahl, the little girl Sophie befriends a friendly but lonely giant and the adventure begins from there. Not yet rated. Yep! Its another Ice Age movie! My kids really have loved all the movies so I would expect this one to be just as good as the other…how many is it now? Basically, the world is in peril and the Ice Age crew has to save themselves…again. Should be a funny film and parents actually like watching these too. I grew up loving the original Pete’s Dragon, so I am hesitant about the remake. But I’m sure Disney will make this magical and bigger than ever! We aren’t sure yet if the story line will be similar to the original movie or go off-course. It still centers around Pete and his best friend, Elliot who is a dragon. Do you have a tween that would like to “graduate” from the animated family flicks this summer? Here are a couple summer movies that the older kiddos will be excited to see! Just making this list makes me excited for summer movie season!! I hope your family is excited for some fun movie adventures and I can’t wait to see these fun films! Now I need to put together a list of summer movies for date nights! You may have seen ads about Circle by Disney and wondered what this is and what it is all about. After our family looked into it, we decided to give it a try and see if it could help in our house. You may not be at the point in your house where you have multiple electronic devices that everyone is using at different times, but our house has iPhones, iPhone Touches, a kid’s computer, laptops and iPads that our kids are on throughout the day. Sometimes these are used for school assignments but sometimes it is just for fun. It can be next to impossible to manage all of these devices all the time. That is where Circle comes in and helps parents monitor all of these devices. At our house, we try to limit the amount of time our kids spend having screen time: television, iPads, games, computer…there are a lot of screens! On top of that, we want our kids to only have access to safe stuff and restrict online access. Circle helps with all this! Circle lets you manage content that your kids are exposed to AND the amount of time they spend online and on apps and games. And parents can manage it all from the Circle app on their phone. Our family has had issues with managing time on devices. As hard as we work, it is really difficult and Circle is helping us really reign it all in. In addition to setting time limits and bedtimes, you can filter out things you don’t want kids to have access to as well as adults. While our kid’s setting doesn’t allow YouTube, the adult computers do so if they want to see an awesome Disney YouTube video, they can get permission from us to see it. This limits the chance of them clicking on something that we don’t want them to see. Parents can also get an insight on each family member and device on what has been played and viewed. What exactly is your tween spending time doing on her phone? What is your preschooler’s favorite game? And how long did they spend on that game or app? That’s it! Just that little white box and it can be anywhere in your house but of course, a central location is best for internet access. If you are interested in getting Circle for your family, you can purchase it from multiple locations including Amazon and Best Buy. You can also purchase directly from Circle by Disney online. All locations offer it for that same price of $99. If you want to read more about circle, visit the meetcircle website. Start this summer off right by limiting kids screens and making management easy! We are loving how simple Circle has made this for us and how easy it is to adjust it from our phones. We highly recommend this system for families. We did not receive any compensation for this review. All opinions are our own and offered by our own accord. Just recently, Disneyland and Disney World rolled out new price changes for park tickets. The changes mainly effect 1-day ticket purchases and that really makes the biggest impact on Disneyland visitors. Most guests to the Disney World will stay for multiple days and purchase multiple day tickets. Multiple day tickets at both parks still offer the better discount as the price per day decreases with each additional day you add. If you are visiting the Disneyland resort this year and plan to visit for one day, now there is a tiered pricing based on the day you visit. The choices are value, regular and peak. If your wondering when the busy times of year are, they are the “peak” price tier. Here is a graphic of the year of the 1-day ticket pricing tiers at Disneyland. So it pays to stay more days at the parks although other costs can add up! If you are planning to visit a Disney park for 1-day, remember to check the new tier pricing. If you are hoping to buy Disneyland tickets for a reduced price, be leary of companies you find on the internet that offer savings as there are a lot of scams for Disneyland. 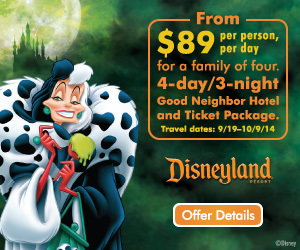 Our friends at Get Away Today offer special deals for Disneyland tickets and are a local travel agent. We also recommend the site Undercover Tourist for both Disneyland and Disney World discount passes although they mainly have multiple day passes. As always, our friends at Destinations in Florida always have deals for Disney World! Unless otherwise stated, all images, text or other content posted on this website are owned by Preschoolears. You are welcome to link to this blog or use a single image and brief description, but you must include a link back to this blog. You may not republish posts in their entirety without our permission. The opinions expressed on this website and blog are our own, and have not been paid for. We are not part of the Disney company or represent the Disney company with our website. We are also not travel agents and are not selling travel packages or products. This blog does accept cash and products for advertising and sponsorship, and all content will be identified as sponsored. Any product claim, statistic or other representation about a product or service should be verified with the manufacturer or provider.